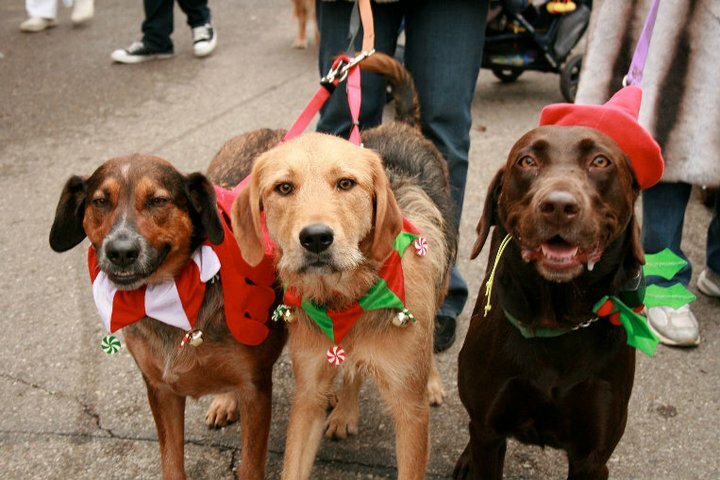 Due to recent cold and icy weather, the long-time holiday tradition of the Mount Adams Reindog Parade was canceled this year after trying to reschedule it twice. Fortunately, this weekend brought clear skies, warmer temperatures, and a burst of creativity. The Over-The-Rhine Kennel Club held an impromptu dog parade along the streetcar route, from Washington Park along 12th Street and ending at Neon’s, a pet-friendly bar. Participants were encouraged to dress up their pups in costume, as was the tradition with the Reindog Parade, and embark from the Washington Park dog park Sunday afternoon. Dozens attended the event with their furry companions clad in holiday cheer and checked out the construction progress along the route. This entry was posted in Connect, Public Outreach and tagged Cincinnati, Engagement, Events, Over-the-Rhine, route, Streetcar, washington park.